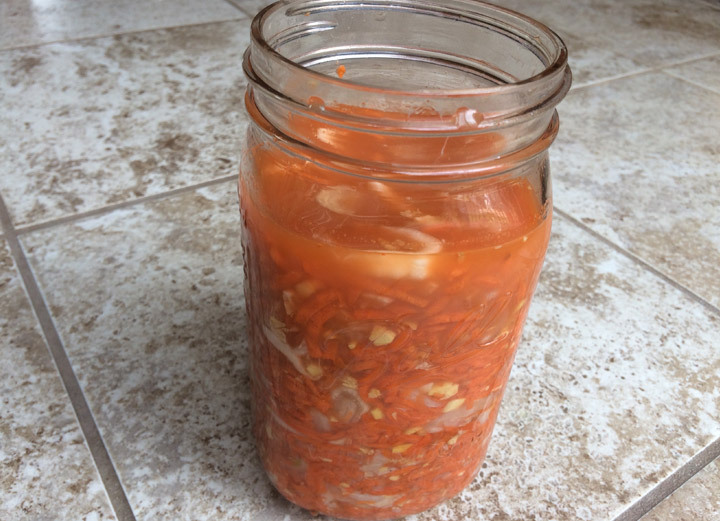 Today I’m going to show you how to make my very favorite homemade fermented ginger carrots. 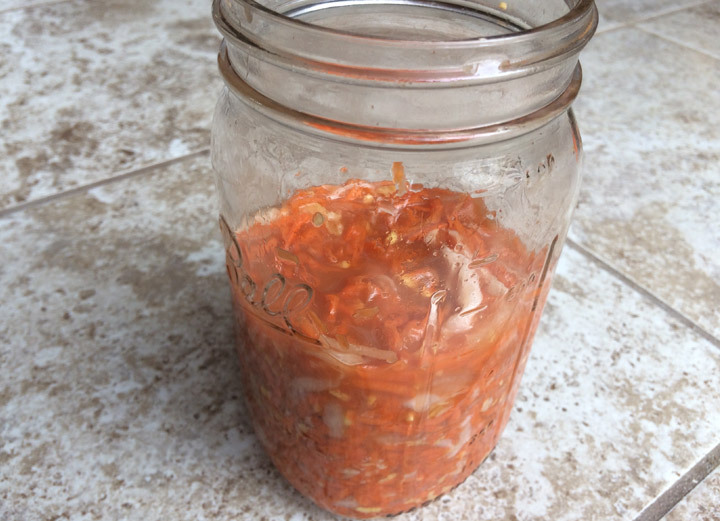 If you’ve ever wanted the probiotic health benefits of sauerkraut but don’t love the taste…try this! It’s just as easy, versatile and extremely tasty. My kids even love it. For starters – you do not need any sort of special equipment or starter culture. In fact, you may have everything you need in your kitchen right now. And once these bad boys are made, you can enjoy them like I do – on eggs, with avocado, as a garnish on Asian dishes, on salads or as a side dish to perk up the flavor of chicken, beef, fish…almost anything! I like using the brine (liquid in the jar) as a salad dressing as well. That’s just 30 minutes of hands-on time, total. You got this! In fact, once you get comfortable, you might double the batch and make twice as much all at the same time. First, shred your cabbage. 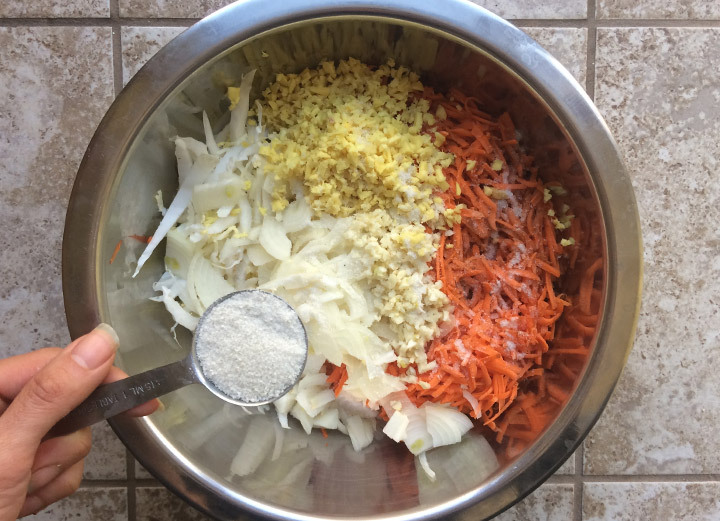 You can use a knife or food processor shredding blade. Or shred it up with your teeth! Come on people, let’s get weird! Just kidding. Try not to use your teeth. It doesn’t really matter how fine the cabbage is, the texture is up to you. I usually use a knife. 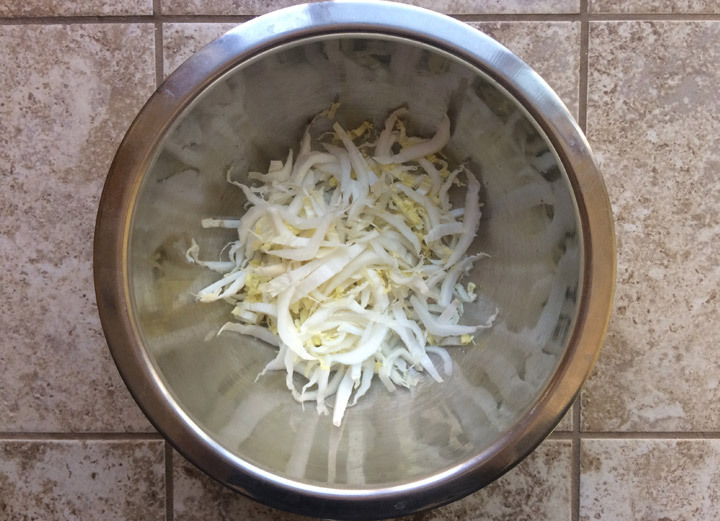 You need 2 cups of shredded cabbage. Put it into your bowl. 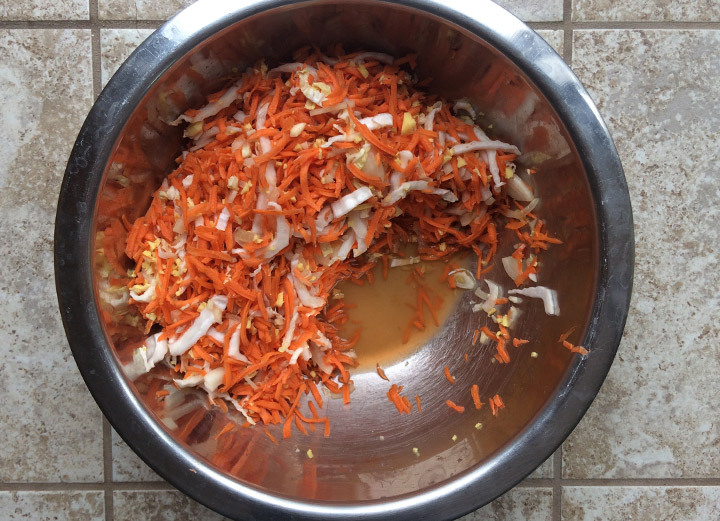 Then, shred your carrots and add them to the bowl. I like to use my food processor for this. Next, mince your onion and garlic. Add it to the bowl. Your ginger needs to be peeled, which is easiest to do with a spoon. Then grate or mince it. Throw it in. Now it’s time for the salt. Dump it on top of your veggies. Get in there with your (washed) hands and mix it all up. Yes, you could use a spoon. 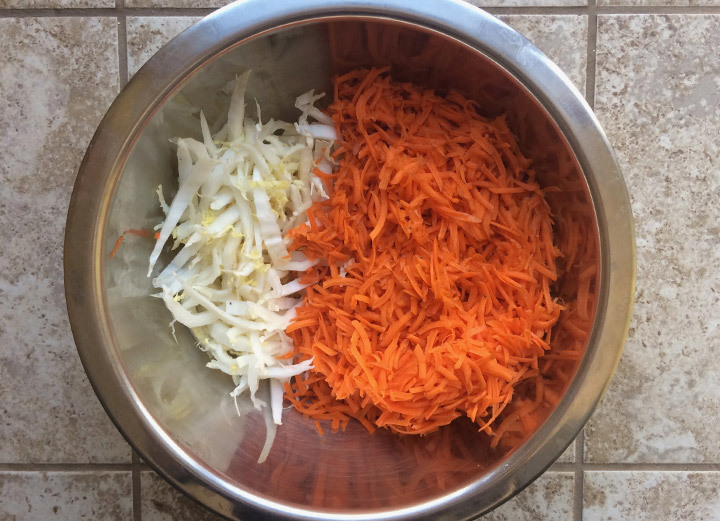 But cabbage and carrots are both self-brining vegetables and it helps to give ’em a good massage with a squeeze or two. If you’re wondering what I mean by “self-brining” it’s basically why we don’t have to add any water to this recipe, yet in the end the veggies will be covered in liquid. You’ll see. Now walk away. You’re going to let that bowl sit on the counter for at least 4 hours. I usually do 8 hours or overnight. You can drape a towel over the bowl but don’t worry about making it airtight or any of that nonsense. After enough time has elapsed, you’ll notice some liquid is beginning to appear at the bottom of the bowl. That’s perfect. Now it’s time to transfer your veggies to a glass jar. I like to use a wide-mouthed funnel to make this easier, but it’s not necessary. Stop when the jar is about 1/3 full and press the contents down with your spoon to really pack it in. Then continue filling. When your jar appears full, you might think you’re done. You’re not. 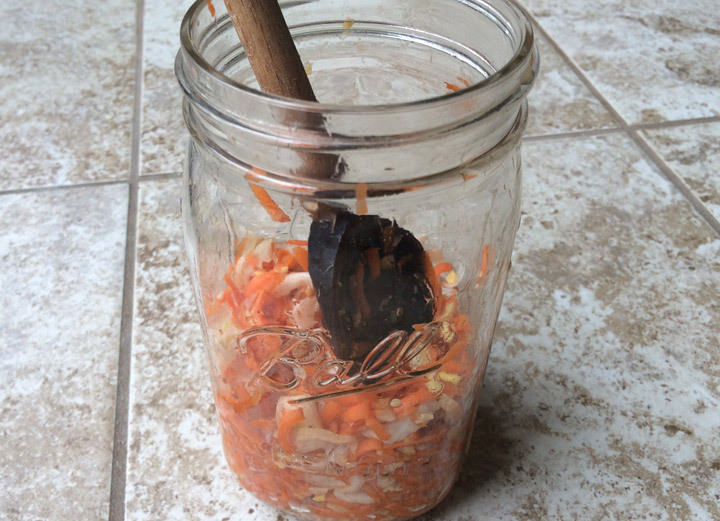 Use your wooden spoon to press down the contents of the jar until the brine level rises above the veggies. This steps takes some oomph. Put your back into it. You can also pour the brine that spontaneously appeared in your bowl into the jar. That’s not cheating. You’ll notice that your once-full jar is no longer full at all! Great. 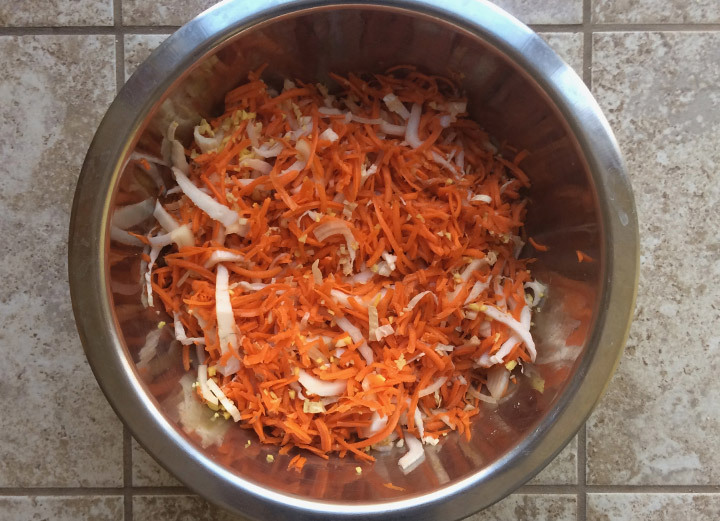 Now you have room for the rest of your carrot mixture. 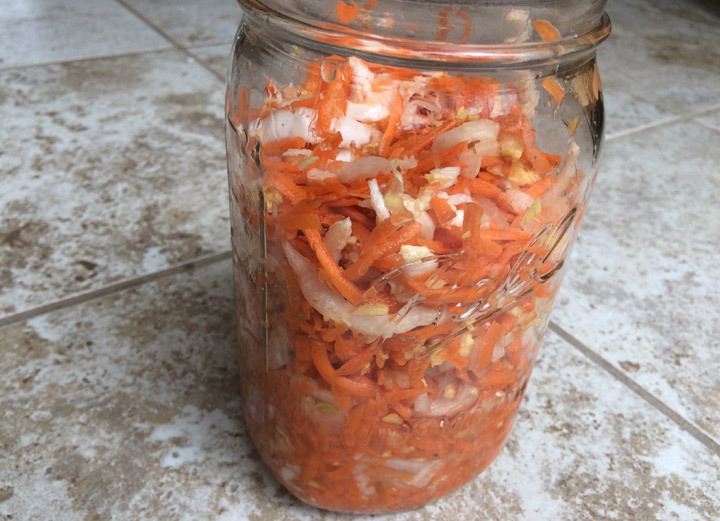 Leave about 1″ of empty space between your brine and the lid of your jar. This is called “headspace” and it’s some space for gas to collect without exploding your jar. Don’t worry, your jar won’t actually EXPLODE if you forget headspace. But it will likely get messy as stuff starts leaking out. Remember, this food is alive! Screw on the lid and let the jar sit on your counter for about a month. Yep, mark your calendar! In the meantime, you can check on it now and then. Unscrewing the lid will let gas escape and avoid that whole explosion-not-really-an-explosion situation too. Just make sure the veggies stay submerged as anything exposed to air could grow mold. If you get a little mold, just scrape it away. If you get a lot of mold, um, use your judgement. 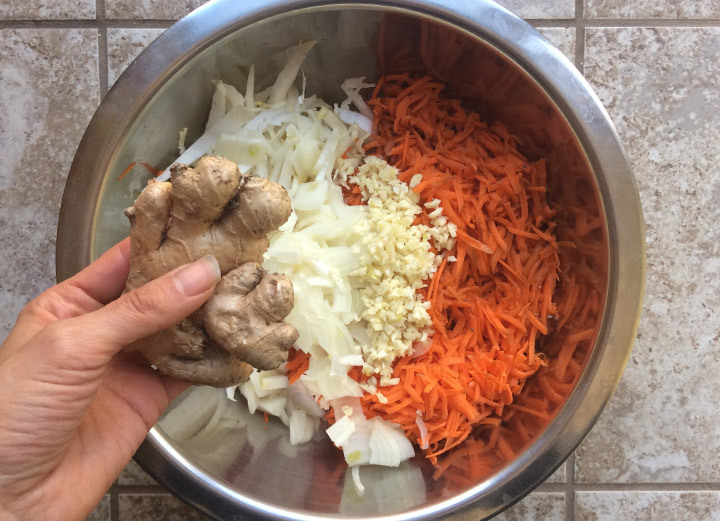 I’ve never had a batch of Ginger Carrots go bad but if you do, it’s all about using your nose. Ask yourself: does this food smell tangy and fermented? Or does it smell GOD AWFUL like you want to run away from it immediately? Your nose knows. After about month, your Ginger Carrots will be ready to eat. Transfer the jar to the refrigerator and they will last for a long time.